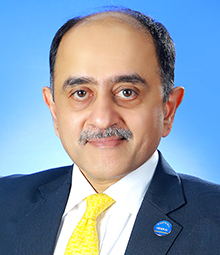 Managing Director and CEO, The Federal Bank, Ltd.
Ethics and excellence. Shyam Srinivasan, in his career of over 20 years, has lived these values as a banker, administrator and leader. Awarded as one of the Greatest Corporate Leaders of India by the World HRD Congress, Shyam Srinivasan is also an honorary fellow and governing council member of Indian Institute of Banking and Finance. He holds many prominent positions in the industry such as Chairman of IBA Committee on Member Private Sector Banks and Member of the Committee on Financial Sector Legislative Reforms set up by Reserve Bank of India. At Federal Bank, he has been instrumental in implementing various path-breaking initiatives, which have put Federal Bank prominently on the national banking map. These include creating an inherent capability within the Bank to reinvent and reimplement processes - especially the customer-critical ones, initiating the Total Quality Management Journey of the Bank, focusing on underwriting quality at every stage right from credit selection and incubating the human resource potential of the Bank. Shyam Srinivasan is an alumnus of the Indian Institute of Management, Kolkata and Regional Engineering College, Tiruchirapally. He has completed a Leadership Development Program at the London Business School and has served on the Global Executive Forum (the top 100 executives) of Standard Chartered Bank from 2004 to 2010.